For the 2007-08 season, Reebok developed a “jersey system” which was intended to create a lighter NHL jersey that would enhance player performance. That of course was the Reebok Edge jersey system. Perhaps their initial goals weren’t reached, but I believe this change has driven up revenues for both the NHL and Reebok to levels not previously seen. Since that first Edge season, I have come to believe that more changes have occurred to teams’ uniforms than in pre-Reebok eras. I will set out to examine my theory in this article as well as gather other numbers and interesting facts. Before we begin I will inform you that I will not be counting All-Star Game jerseys in my numbers as the designs change almost every year and they will skew the numbers in a certain direction. In 2007-08, 62 Reebok Edge sweaters were used across the NHL. 30 teams with a home and road set, as well as Winter Classic sweaters for Pittsburgh and Buffalo. Of the 62 sweaters we saw that season, only 33 of them remain in use for the 2013-14 campaign. In terms of a percentage that’s 53.2% remaining in the NHL! At the end of the 2013-14 season, we will have seen 90 different sweaters used this season. 30 teams with a home and road set, 18 teams with an alternate, as well as 12 outdoor game or vintage sweaters. Those 90 sweaters amount to a 45.2% increase in the number of sweaters in use during the 2013-14 season versus 2007-08. In seven NHL seasons since the Reebok Edge jersey program began, we have seen 83 individual sweaters unveiled and retired (by my count). That number includes the Thrashers jerseys, all discarded home-away-alternate jersey sets, specialty jerseys (Montreal 100th anniversary), and Winter Classic sweaters that didn’t stay on with the team. Comparing that to the seven NHL seasons prior to the Reebok Edge jerseys (no 2004/05 season), there were 66 sweaters in use during the 1999-00 NHL season. By 2006-07 there were 80 sweaters in use in the league. That’s a 21.2% increase. In 2006-07, there were only 24 jerseys, out of the 80 in use, that were not in existence seven seasons prior. 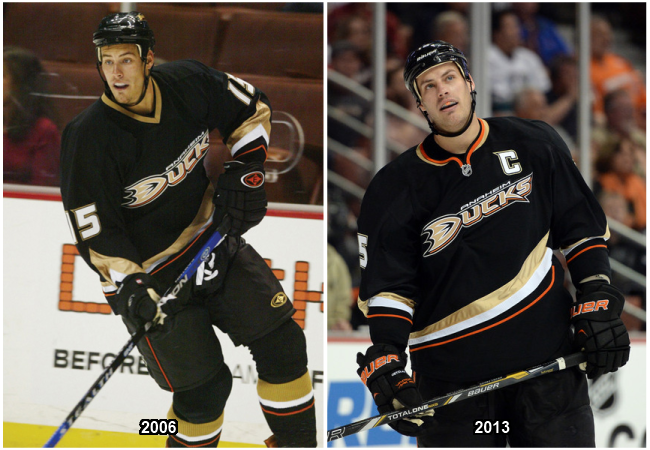 In 2007-08 there were no alternate sweaters. In fact, the only teams to wear sweaters other than their homes and roads were the Buffalo Sabres and Pittsburgh Penguins in the 2008 Winter Classic. Alternate sweaters were re-introduced for the 2008-09 season with 18 teams adopting an alternate. Of those 18 alternate sweaters, two of them were white and the rest were coloured. In the “Edge era” only four teams have used a white alternate sweater on a full-time basis. Dallas and Toronto had white alternates from 2008-09 to 2010-11. Washington currently uses a white alternate and has done so on a full-time basis since the 2011-12 season. Finally, the Vancouver Canucks used a white alternate jersey to celebrate their 40th anniversary during the 2010-11 season. During the inaugural Reebok Edge season (2007-08), 14 of 62 sweaters used collar laces. That’s 22.6% of the jerseys in use that season. For the 2013-14 season, 37 of 90 sweaters are using collar laces (41.1%). That number is likely to rise though as teams have yet to unveil the sweaters they will be wearing for the Stadium Series games and the Heritage Classic. The following is the number of jerseys using collar laces by season. Now to the core of this examination, as we’ll look at how many NEW sweaters have been introduced each season from 2007/08 until 2013/14. Then we’ll look at another seven season span, 1999/00 until 2006/07. Of the 80 sweaters in use during the 2006-07 season, only 15 EXACT copies were transferred over to the Reebok Edge jersey cut the next season. Of the 15 direct transfers, 12 still remain in use in the NHL for the 2013-14 season. Those jerseys are Anaheim (H & A), Chicago (H & A), Detroit (H & A), Montreal (H & A), New Jersey (H & A), and the New York Rangers (H & A). Whether the increase of new uniforms in the Reebok Edge era is intentional or not is unknown for the most part. The NHL stages their outdoor games and asks teams to wear “fauxback” uniforms to drive up revenues. However, it’s not clear whether the NHL has the same influence behind teams changing their home, road, or alternate jerseys with frequency. If you think I may have missed some facts in this article or if you don’t agree with my opinions then be sure to let myself and others know in the comments. A big thanks to NHLuniforms.com. Without that awesome source, I would not have been able to gather all of these numbers. I think it's a combination of modern marketing/profits and the fact that it's just a lot more commonplace and not only accepted, but encouraged by fans. Fans of classic-jersey teams like Montreal, Chicago and NYR don't necessarily look for extras other than the occasional special occasion look, but for teams like Toronto or Calgary, part of their history is constant change... So it's a combination of pure marketing objectives and fan desire. Pretty interesting read. I had realized before the larger amount of changes in jerseys since Reebok took over but didn't realize it was this large.